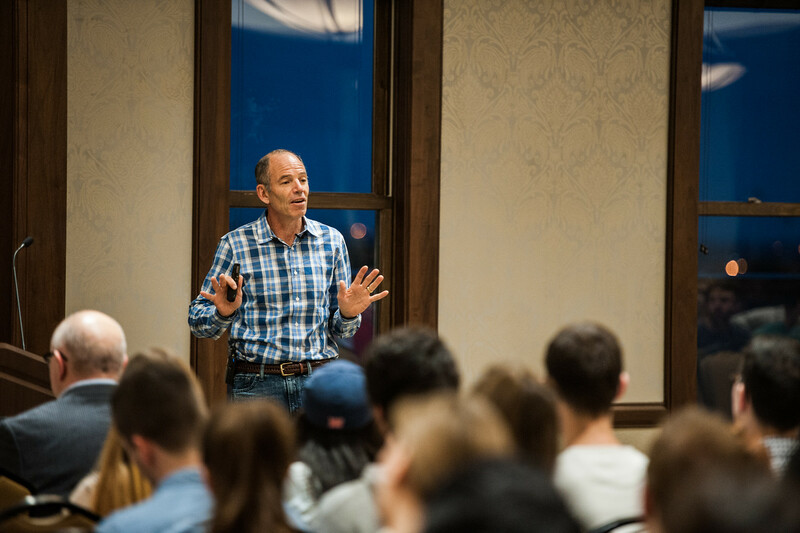 Entrepreneur, investor, mentor and co-founder of Netflix, Marc Randolph is widely known for his love of startup culture, idea generation creativity and commitment to optimism. During the Center for Entrepreneurship’s kick-off event for Entrepreneurship Month held on Tuesday, Nov. 3, Randolph addressed a group of students, faculty, staff and alumni on the power of the entrepreneurial spirit and his experience with Netflix. And that’s exactly how Netflix started. After learning he was going to be laid off from a Silicon Valley software company, Randolph and his future Netflix co-founder Reed Hastings began working through hundreds of ideas during their commute to work each morning. Once he got to the office, Randolph would research ideas and based on his findings, some began to stick. Even more were abandoned. Randolph said it’s this stage and his persistence that stick out most to him. Though 99 out of 100 ideas were discarded, the duo kept working towards finding one worth pursuing. Netflix was that idea. After a number of trials and test periods, Randolph and his team launched the company on April 14, 1997 and after spending a day rebuilding servers that couldn’t handle the traffic, 100 customer orders were received. Now, 18 years later, Netflix has over 60 million subscribers. The biggest piece of advice Randolph passed along to entrepreneurial hopefuls was what he calls “validation hacking.” To prove traction for any idea, startups must validate their plan – but this can be costly. To avoid the costly stages associated with testing, Randolph recommends an approved version of hacking where products are created without actually building anything. By creatively testing an idea or product without making anything costly, startups can research and validate their ideas. Randolph was the University’s Moench speaker for 2015. The Moench Entrepreneurship Lecture Series has been funded by gifts from the late Ernest J. Moench and his wife, Anna.